It was a beautiful day for a trip down Bayou Manchac, and it was such a nice trip, we just had to keep going. It was starting to seem as if the 30s at launch time might become permanent, so when the forecast came out for Saturday, there was no way we were going to miss out. There may have been predictions of showers, but that’s not much of a deterrent when we’re often rather damp enough already from hauling things out of the water. We arrived at Highland Road Park and started gearing up, and a check of the weather showed a current temperature of 64°F. Now *that’s* nice. We started down the bayou at 8am as usual. Then we kept going. And going. There just wasn’t anything that needed doing. The only thing even mildly of note was that it was a double-up day: the last mile or so of Bayou Fountain was flowing backward, so it was upstream both ways. Double-up days don’t happen very often, but even less prolific are “zeroes”, i.e. trips where we find no work that needs doing. I’ve only had one zero since we started working on Bayou Fountain in earnest, and Mike hadn’t had any, so as we neared Bayou Manchac, I dropped back into trail and let him officially chalk this one up (a double-up zero, even). 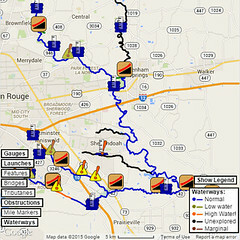 We made very fast progress down the bayou and back up again, and by 11am, we had already paddled the 8.4 miles we usually do in a normal work day. Without all that pesky manual labor to slow us down, not only did we make amazing time, but we weren’t a bit tired. There seemed but one thing to do — we dropped off one canoe and most of the heavy gear, and we continued upstream from Highland Road Park in an unusual twin-engine configuration. 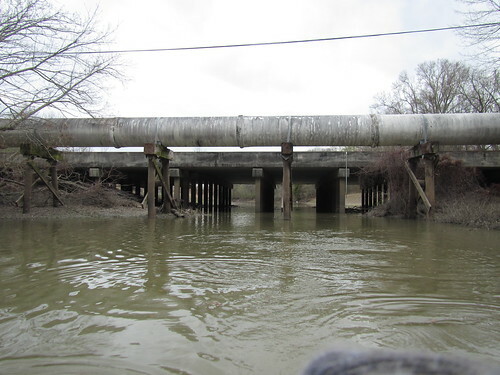 The bayou got a bit shallow just upstream of the Burbank (Siegen) bridge, but it wasn’t bad, so we kept on. We passed the pretty Grand Lakes Drive bridge and the… interesting… bridge made of two 18-wheeler flatbeds bolted together. (I noted that they were on the correct sides, too: red-right-return, with the green on the left.) We passed Bluebonnet and went right under the pipeline with just a quick duck. After that, we started hitting shallower spots with embedded tires, debris, or just muck, but we were not significantly impeded. Just a bit after passing Gardere, we arrived at Staring. 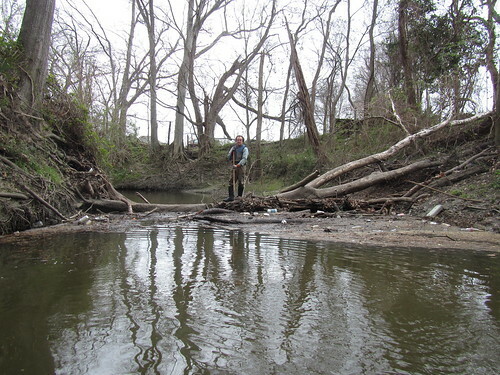 Previously, I’d only been that far when the water was high, and the very large (sewer?) 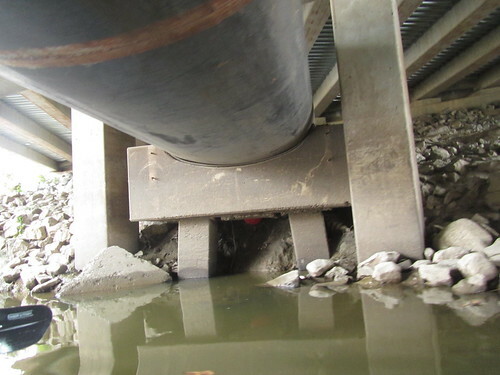 pipe under the bridge made for dangerous conditions. 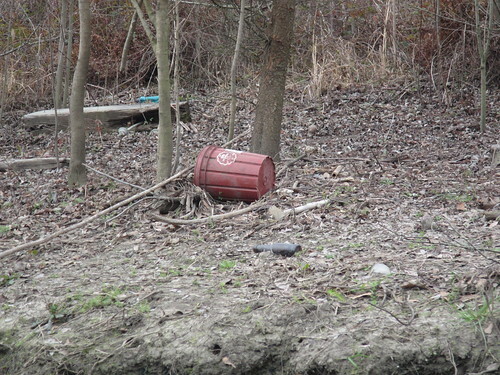 Now, however, the water was low, and I discovered that the pipe was not quite as it appeared. While it seemed to be a gargantuan pipe when the water was high, it turns out that in cross-section it’s more of a flattened ellipse than a circle. There was plenty of room to pass under it without issue, and having even a bit more water would have been fine and helped us hit fewer obstacles. Well, naturally, we pressed on. 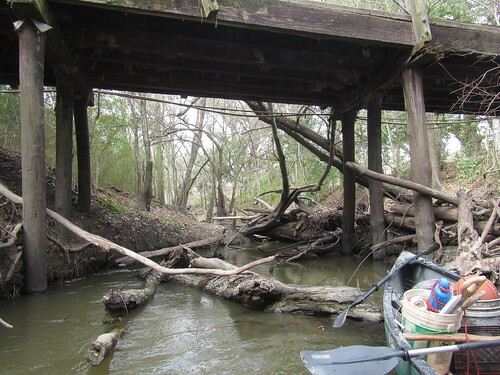 The bayou narrowed considerably compared to areas downstream, and there were many tires, office chairs, shopping carts, and other obstacles (not to mention occasional brick or concrete rubble or dreaded rebar), but my canoe’s seen it all before, so we kept going. 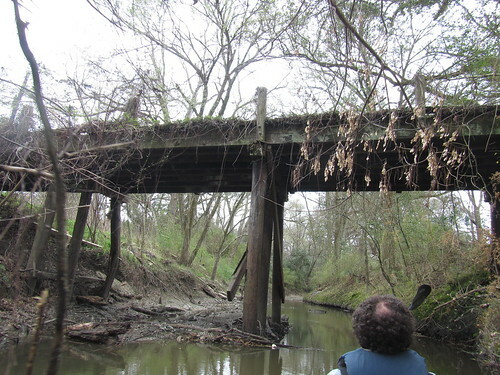 Soon enough, we encountered a derelict bridge. It was passable on the water (after a fashion), but I don’t think I’d even want to try to scurry across it. From there, the going got rougher, as there were more shallows with more debris, but who are we to turn back just because something becomes marginally harder? We need a good, solid excuse to call it a day, so on we went. The amount of debris wasn’t overwhelming, but it was certainly substantial. We could spend a good weekend pulling up all the tires and staging them for a high-water retrieval and not even have time to start on the other bits, but *technically* we could navigate it. Well, until the next bridge. We’d managed to go this far, but that’d be the end of it. Just a bit over four miles upstream of the Burbank/Siegen bridge, we looked at the trees and giant logs blocking the way forward, and we finally called it a day. Theoretically, you could cut it all up into moving pieces with only a large chainsaw and a good day’s work, but considering we were well beyond the paddle trail and armed only with hand saws, well, even we know our limits. Sometimes. Did I forget to mention that between Gardere and Staring, there were just a few total obstructions? Oops. 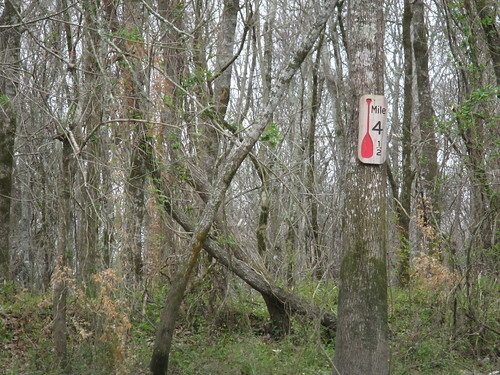 Well, there were, and they provided us with a nice diversion on our way up and down the bayou. 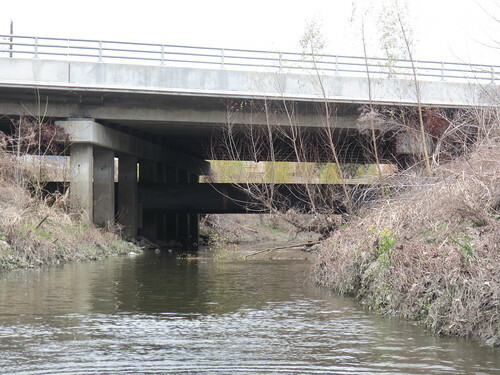 If there were another access point upstream that would potentially yield a nice paddle trail section, we’d certainly tackle the problems, but at least at this point, they’re not likely to bother anyone. That being the case, we had fun hopping up on the logs, dragging the boat over, and reboarding. It’s not a chore if you enjoy it, right? Once we were back downstream of Gardere, things went back to being a bit easier. The water was shallow enough to hit obstructions here and there, and the shallow, stagnant water meant vast algae blooms. They covered the bottom (and sometimes the surface) in stringy muck — I’d certainly not want to swim there, but it wasn’t “hard” paddling. While it was certainly not the best segment of Bayou Fountain, it wasn’t bad on a windy spring day. In fact, it was such a nice day, we even got another queso fresco bucket! (That means they must be coming from somewhere upstream of Bluebonnet, too.) Oh, and we paused at Bluebonnet to saw up a few logs that the pipeline footings had caught. The way through is wide open there (provided the water level isn’t such you hit the pipeline). 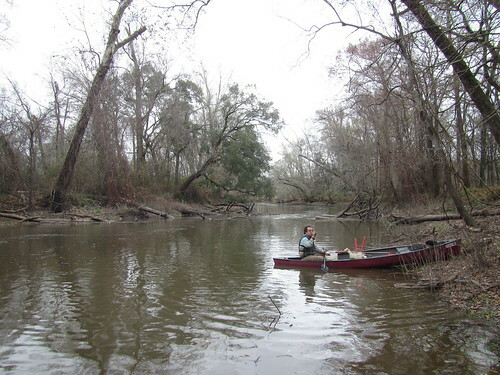 It had taken almost eight hours to paddle all the way down and up and down the bayou, but finally we arrived back on the signed, sheltered, wonderful paddle trail. 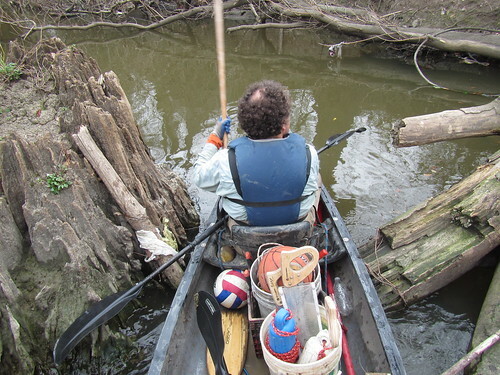 Having now explored over four miles upstream of the start of the paddle trail (i.e. 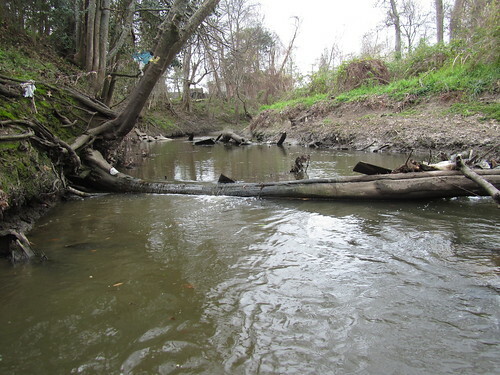 Burbank/Siegen), we can certainly say that we’re quite happy with the section we chose for our flagship paddle trail. It’s sheltered from summer sun and windy days. It’s deep enough to only rarely have minor shallows. It’s wide enough to feel like a real waterway. It’s just great all around. We still have litter issues and regular maintenance to deal with, and it’ll be quite nice when we finally get improved paddle launches, but it’s already the best thing going. We look forward to seeing you out there.